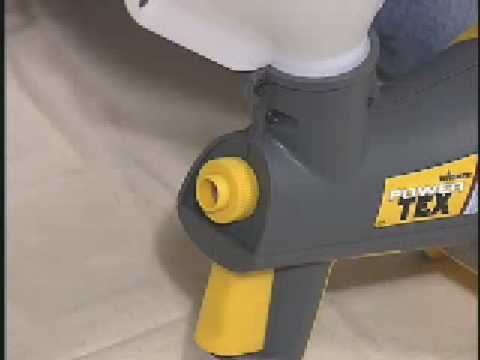 The Wagner PowerTex texture sprayer features a built-in air turbine that eliminates the need for a separate air compressor, making it easy to tackle a variety of texturing projects. The on-board hopper holds one gallon of material, while the three included nozzles allow you to spray aggregated and non-aggregated materials in popcorn, knock-down and orange peel patterns. 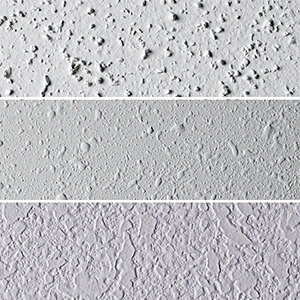 The PowerTex is ideal for spraying texture on ceilings and walls. When it's time to clean up, it comes apart into four easy-to-wash parts. Power Tex is rated 4.6 out of 5 by 13. Rated 5 out of 5 by dalandshark from Perfect for Home Owners I have used this for many rooms in two homes. Works well. Have owned it for 8 years. Paid for itself many times over! Also own Wagner wall paper steamer. Great products! Rated 3 out of 5 by tmils from Could use some design tweeking I bought this gun because I didn't want to have to drag an air compressor everywhere I go (do this as a side business). I was worried that it would not have enough power to shoot a ceiling but gave it a try. It shot an 8 ft ceiling fairly easily, Shot it twice but not out of the ordinary. Shoots walls nicely. My problem is with the hopper, the opening is too small do dump texture from a 5 gal bucket into it without making a mess. Fanning out the top so it is bigger while keeping a handle would make this a 5 star rating. Fix this and you will have knocked it out of the park. I like that you can adjust the hopper from ceilings to walls without clamps. For the most part it is a good machine and would recomend it for smaller jobs. Rated 5 out of 5 by friday4 from Worth Every Penny! Product does everything it says and does it well. I'm a do it yourselfer and used this to do orange peel on entire ceiling of a 2400sqr foot home......I've run about 12 gallons of texture thru it and it has never failed.....flawless and great texture......Clean up is easy.....congrats to whoever designed this Wagner product! Rated 5 out of 5 by shuttersdrywall from amazing I am a Drywall Contractor and typically I do al my textures by hand. I needed to match an existing texture in a renovation of a new hotel, soundproofing, but I couldnt match it by hand and I did not want an over spray from a traditional hopper. I did 14 walls in 1 day and matched the existing texture(a knockdown) perfectly! I will buy another for my company, this is truelly an amazing product. Rated 5 out of 5 by jesseg from Hands down the BEST Texture Sprayer I was using a traditional hopper/compressor setup but it was taking to long to do my 17' x 14' living room. I did some research and found this bad boy. Finished the job including ceiling in 4hr for me that's good. A pro would have been done in half the time. 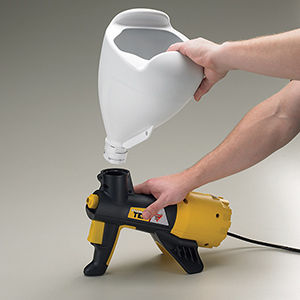 How do i purchase spare spray nozzles for my Wagner Power Texture spray gun? We have parts in stock call us at 1-800-328-8251. The part number is 0520101 for the set and they can be ordered from us at 1-800-328-8251. Which is the best nozzle to use for an orange peel texture? The size of the nozzle doesn't change pattern, just the amount applied. The heavier you want the application, the larger the nozzle you can use. For best control, use a smaller nozzle. For more tips call technical support at 800-328-8251. I lost the 3 nozzles for my Power Tex. &nbsp; Is there a way to order replacements? Yes, you can place an order with us over the phone. Our phone number is 1-800-328-8251 Monday-Friday 8:00am-4:30pm Central Time. Can it spray just dry light sand? We have not tested the PowerTex with dry sand and do not think it will work at all. Where can I buy this unit tomorrow in Orange County Calif.? Check with your local Home Depot. 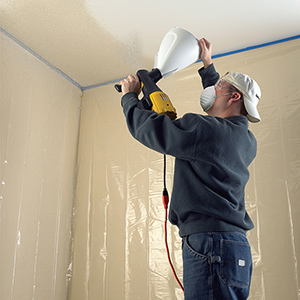 Could the sprayer be used for synthetic stucco? If it's mixed to a pancake batter like texture it will spray very well with the PowerTex. For more discussion please call us at 800-328-8251. Can I spray a heavy-bodied paint (texture paint) with this? 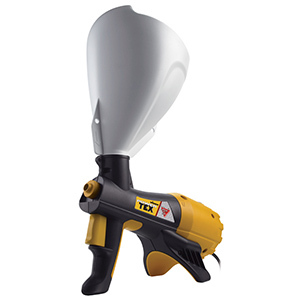 The Power Tex is meant for spraying thinned drywall compound to create a knock down texture or popcorn mix. The paint type that you mention might spray better through our iSpray nozzle on our Flexio line of HVLP, like the Flexio 570, 2000 or 690. For more info call us at 800-328-8251.